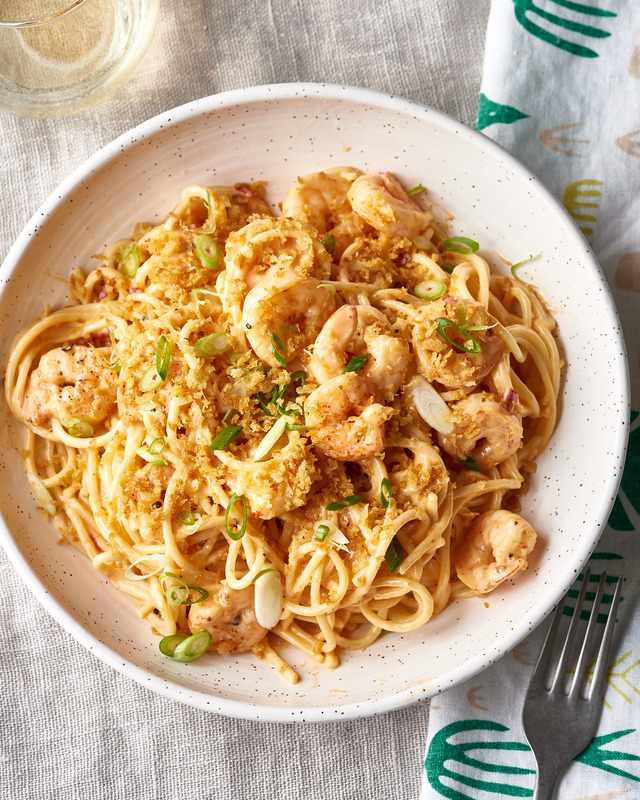 If your weeknight pasta routine has become, well, routine, consider adding this flavorful shrimp dish to the roster. 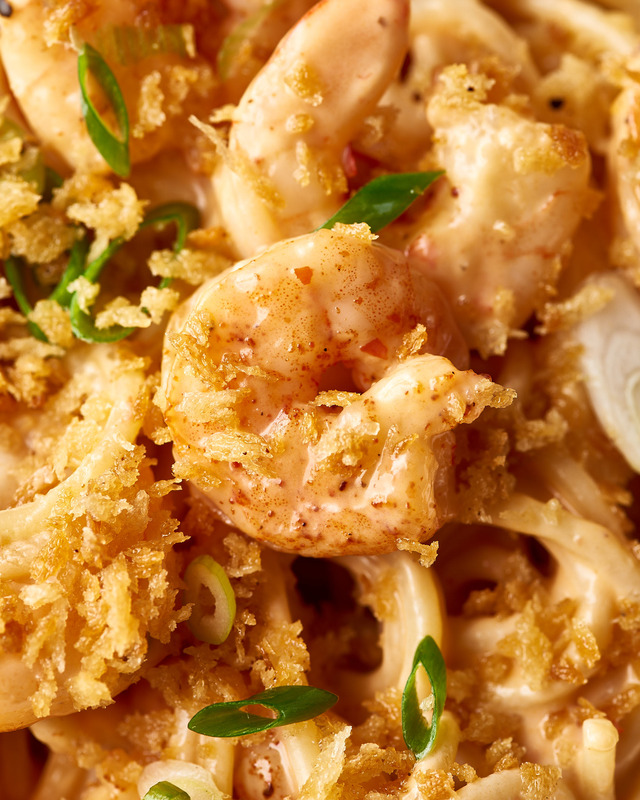 Inspired by Bonefish Grill鈥檚 cult-favorite Bang Bang shrimp 鈥� beloved for its creamy, sweet, and spicy chili sauce 鈥� this recipe is cheaper than dining out, better for you than takeout, and simple enough for even the busiest of nights. While Bonefish Grill鈥檚 Bang Bang Shrimp is obsession-worthy, it鈥檚 definitely more of a special-occasion dish. The shrimp is deep-fried and tossed in a rich mayo-based sauce 鈥� no wonder it鈥檚 so good! To lighten it up, we swapped the mayo for Greek yogurt and ditched the deep-fry. Instead, the shrimp are roasted on a sheet pan, but you still get all the crunch from a big handful of toasted, seasoned breadcrumbs that are sprinkled on top. While the shrimp is usually served alone as an appetizer, we opted to toss it with spaghetti and call it dinner, since the creamy sauce is too good not to turn into a pasta sauce. Oh, and while many copycat recipes call for a couple of different Asian chili sauces 鈥� often Sriracha and Thai sweet chili sauce 鈥� we opted for just chili-garlic sauce, which has the heat of Sriracha and flavor of sweet chili sauce. Melt the butter in a small skillet over medium heat. Add the breadcrumbs, salt, black pepper, cayenne pepper, and garlic powder. Cook, stirring constantly, until golden, crispy, and fragrant, 4 to 5 minutes; set aside. Arrange a rack in the middle of the oven and heat to 400掳F. Lightly coat a rimmed baking sheet with cooking spray; set aside. Bring a large pot of salted water to a boil. Meanwhile, whisk the yogurt, chili-garlic sauce, honey, garlic powder, and half of the lime juice together in a small bowl; set aside. When the water is boiling, add the pasta and cook until al dente, about 10 minutes or according to package instructions. Meanwhile, pat the shrimp dry and place on the prepared baking sheet. Season with the salt, black pepper, and cayenne and stir to coat. Spread into an even layer. Roast until the shrimp are opaque and pink, stirring once halfway through, 6 to 8 minutes total. Drizzle the remaining lime juice over the shrimp and toss to coat, scraping up any flavorful bits on the baking sheet. Drain the pasta and return it to the pot. Pour in the yogurt sauce and toss to evenly coat the pasta. Add the shrimp and any juices from the baking sheet, along with half of the scallions, and gently toss again. Generously sprinkle each serving with the crispy breadcrumbs and remaining scallions. Serve immediately. Make ahead: The sauce can be made up to 1 day in advance and stored in a covered container in the refrigerator.